Club Doncaster Foundation teamed up with the Club Doncaster Sports College to deliver workshops around mental health to its students in line with Time to Talk Day 2019. The day itself, which included appearances from Doncaster Rovers winger Matty Blair and the Rovers youth team, saw 130 Sports College students learn more about mental health, coping mechanisms and support networks available for anyone struggling with mental health. Wellbeing workshops, which not only focussed on not just dealing with mental health, but also on physical activity, relaxation, food and mood and overall wellbeing, were ran throughout the day at the Keepmoat Stadium. Alongside this, a motivational mental health talk with former professional boxer and current boxing coach Jimmy Harrington also took place. Jimmy opened up about his own mental health struggles, which proved to be invaluable to the student. Head of Foundation, John Davis, said: “Campaigns like this give mental health the platform it needs to become something that we all talk about. The opportunity allowed students to have conversations about mental health, which helped to break down stereotypes, improve relationships, aid recovery and take the stigma out of mental health. 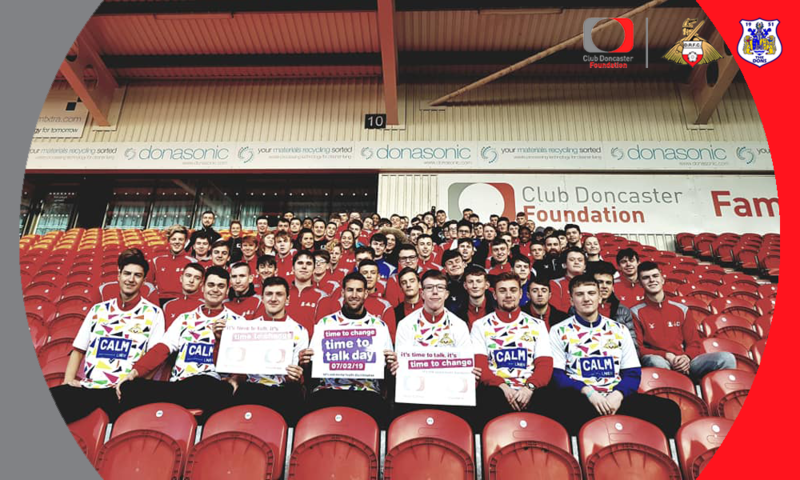 Adi Turnpenny, Club Doncaster Sports College Principal, said: “We hope the students gained a greater awareness of mental health issues from the Time to Talk Day, it is important that we help remove the stigma and show that these issues can be overcome. Doncaster Rovers recently released a third kit, with the help of NHS Doncaster CCG, aimed at helping to raise awareness of mental health in Doncaster and beyond. The third kit is sponsored by mental health charity Campaign Against Living Miserably (CALM) and was designed by 11-year-old Nate Nasir. Matty Blair also handed out the new shirt to the College students on the day.